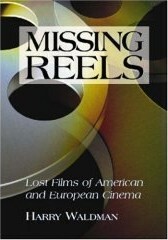 Reprinted from its 2000 hardback publication, Missing Reels- Lost Films of American and European Cinema (hereafter Missing Reels) is a sobering volume, listing as it does almost 1000 films which have vanished from the world cinematic map, possibly forever. Surprisingly, Waldman does not open his book by dwelling on the possible reasons for their disappearance- these include the unstable nitrate film stock, the lack of regard for the fate of silent films when sound came in and also the impact of war, not to mention natural disaster- in many cases fire. The Introduction, in contrast, provides some stark statistics- some 80% of films from the pre. 1918 cinematic world no longer exist, this unhappy fate being shared (surprisingly) by 15% of films made between 1930 and 1950. Missing Reels is organised alphabetically by country, with missing films listed in the same manner within each national section. The film titles are the original ones, an English translation for the European titles being given in brackets. Details of director, date, chief technical crew and a plot synopsis are provided below this, with some contextual background given at pertinent points. In addition, a tantalising array of stills is spread throughout the book to give some indication of what has been lost. Some of these give next to nothing away (for example The Hidden Life) but others evoke a true narrative excitement (Huntingtower, The Battle Cry of Peace). Although the familiar ‘faces’ are here (ranging from The Ghost Train to Four Devils via The Mountain Eagle), the inclusion of lesser-known titles too is a big positive, for it widens awareness and gives credit to productions which through no fault of their own have vanished off the cinematic radar. The very methodology of any book is an interesting one, but in this case I feel it is misguided. As the film titles are in alphabetical (and not chronological) order, it is not possible for one to observe the ‘latest’ (ie- most recent) films to suffer the vagaries of time- instead, one has to flit about. As a consequence, there is no idea of progression and development of national cinemas and even stars (which could have been a usefully inherent attribute). As the alphabetical index at the rear of the book lists all film titles one wonders why there is the need to duplicate this earlier. There is also the paradoxical nature of the whole topic- there is a need to raise awareness and highlight these casualties, but, on the other hand, do we really need expanded details on a lost 1916 Hungarian film? The answer to this is a tricky one if we are to avoid accusations of intellectual and cultural elitist snobbery. My argument would be that it is a chastening fact that, as Waldman states, ‘of the 500 or so silent films produced in Hungary in the period 1912-1930, nearly all are gone’ (p.130), but that is really all the information that is required. The only real interest in the Hungarian section is to note some titles directed by Alexander Korda- lamentably the other titles (and directors too) are mere names and nothing more. The other disadvantage of including a wide range of European countries is the lack of surviving illustrative material- compared to the sections dealing with countries like France and Great Britain, the stills accompanying Greece, Hungary, Portugal and Spain are sparse. This makes already unappealing sections even less appetising. Another major problem in Missing Reels is its lack of precise information. True, some films do not exist at all- but sometimes fragments or a trailer survive. Waldman’s book makes generally scanty reference to these existing elements beyond a sweeping note that x reels exist now and again, although he does draw attention to the Internet availability of existing stills. Where he does go into more detail (for a film like The Rogue Song for instance), the surviving elements are dryly listed without any evident passion and excitement. The existing three minutes of film are practically a revelation- balancing the serious side of the kidnap plot with Laurel and Hardy’s foibles- and merit more comment than is provided. The Rogue Song is, after all, on most film historians’ ‘wants list’ of lost films. Existing elements aside, looking at the actual films that are in fact ‘missing’ also presents a problem. Since the initial publication in 2000 some titles have been discovered (I cite Beyond The Rocks (1922) as Exhibit A here, m’lud). At the very least, a footnote revelling in the news of the rediscoveries is essential- Beyond The Rocks made national news programming due to its long sought-after status and subsequent restoration. Overlooking films that a) have not recently turned up or b) that were not missing in the first place, a missed opportunity concerns the amount of attention given to surprising inclusions. An example is the 1950 Irish film Stranger At My Door. Given the very brief provided synopsis, it would have been worthwhile to highlight how this relatively modern film came to be missing. Was it lost in a fire, or withdrawn from circulation? A similar scenario exists for the Dutch documentaries made in the 1950s which are listed in Missing Reels- how have these disappeared? In this case, as with the Irish film, Waldman’s book does not say. In the modern age of DVD releasing, it is a chastening thought that some worthwhile movies will never be released for a new generation to see. Over time, those who were lucky enough to see, let’s say, Ernst Lubitsch’s The Patriot(1928) the first time around will pass away and there will be no one left alive who has seen what was hailed at the time as a great achievement. If Waldman’s book highlights one thing it is the need to look around and ensure we preserve what currently exists- if von Stroheim’s The Honeymoon (1928) had been backed-up by a print in America the fire at the Cinematheque Francaise in the 1950s would not have claimed this film as its victim. Such natural disasters as fire are no respecters of reputation- it is a striking fact that early film magazines tended to be frank with their opinions and also that the vast majority of titles Waldman includes have highly positive reviews. The logical question to arise from this is: how have these films vanished? Probably, like Waldman himself, we shall never know for sure. The upshot of their status (‘missing’) is that the search can continue. If this search yields one title that could be subsequently removed from a future edition of Waldman’s book it would be a valuable achievement in itself. Reading about such lost movies is a melancholic experience, but it is one that must always be tinged with the exciting possibility of finding even one such treasure- the cup must be not considered permanently half-empty but temporarily thus. In summation, the flaws in Waldman’s book are twofold- a lack of extensive research demanded by his very labile topic, and his at times rather unenthusiastic style. The purpose of Missing Reels should ideally be to highlight these lost films yet also stimulate interest in them- which, taken to extremes, might raise sufficient awareness of any existing material for the films concerned to surface. Thus, in order to both inform yet stimulate a book such as this needs to be vibrant, active and alive- one only has to look at the uninspiring, dull cover to realise that the topic is dealt with in a way that makes the whole subject rather dry. Missing Reels is a creditable attempt to draw together an anthology of American and European films whose status is currently stated as ‘missing’, but its overall effect is like receiving a weak coffee in a miniscule cup- you wish firstly that it was stronger and secondly that it was slightly better quality. 'Missing Reels' is published by McFarland & Company.